Discount of entry fees at most regional SCCA event in the United States. 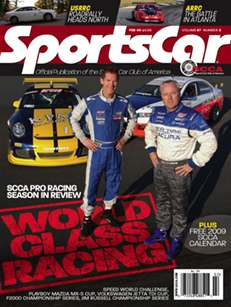 A subscription to SportsCar, the SCCA official monthly national magazine. Discounts on merchandise and services from selected companies that partner with the SCCA. The opportunity to compete in Divisional and National SCCA events. The opportunity to hold a competition and volunteer license. Vote in SCCA elections and serve on committees, chairs and directors. All SCCA members are protected with the best event-related insurance program in motorsports at no additional cost. Properly registered SCCA members who are accidentally injured while participating at SCCA events are covered for up to $1 million in medical expenses. SCCA members, in certain circumstances, are also provided with limited third-party liability insurance coverage at most events. Contact the SCCA Risk Management Department at the national office for details. Become a member of the SCCA Dixie Region #95. Join Now. It’s only a click away. Not ready to Join yet? If you still want more information about the SCCA, fill out the following form to have an information packet mailed to you today! Contact me via Dixie SCCA Facebook!